Apple on Wednesday took covers off its latest flagship iPhone series. Much like last year, the Cupertino giant announced three new variants in its iPhone 2018 lineup, the iPhone XS, iPhone XS Max, and the cheaper iPhone XR. The iPhone XS Max is essentially a larger iPhone XS. The former sports a 6.5-inch OLED display while the latter has a 5.8-inch OLED display. The three handsets were revealed at Apple’s launch event held at Steve Jobs Theater in Apple Park. 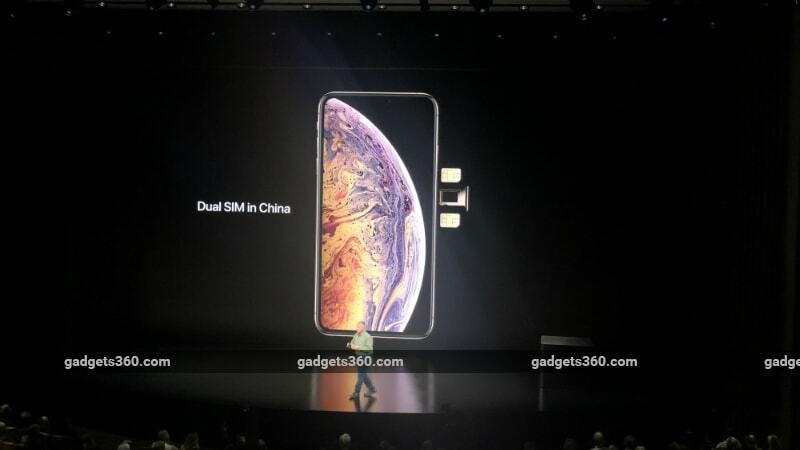 Another major highlight is support for dual-SIM and dual standby (DSDS), though this is implemented with an eSIM in place of the second SIM for most of the world, while China gets support for two physical SIMs in the iPhone XS Max. Finally, Apple also announced the new iPhone models support Gigabit-class LTE speeds. The company also announced the next generation of its wearable, the Apple Watch Series 4. The iPhone XS comes with a price tag of $999 (roughly Rs. 71,800) for the 64GB variant, $1,149 (roughly Rs. 82,600) for the 256GB variant, and $1,349 (roughly Rs. 97,000) for 512GB. The iPhone XS Max has a starting price of $1,099 (roughly Rs. 79,000) for the 64GB variant, $1,249 (roughly Rs. 89,800) for the 256GB variant, and $1,449 (1,04,200) for the 512GB variant. iPhone XS price in India starts at Rs. 99,900, while the iPhone XS Max price in India starts at Rs. 1,09,900. Do note, that the Indian rupee is at its lifetime low. Both the iPhone XS and iPhone XS Max run iOS 12 out-of-the-box; Apple at the event stated that it will soon ship its two billionth iOS device. The iPhone XS sports a 5.8-inch OLED Super Retina (1125×2234 pixels) with the same notch as the one seen on 2017’s iPhone X. On the other hand, the iPhone XS Max gets a large 6.5-inch OLED Super Retina panel with a 1242×2688 pixel resolution, one of the biggest mass-market smartphone displays, with a similar display notch. The iPhone XS Max fits into the same footprint as the iPhone 8 Plus. Both the variants are powered by Apple’s latest A12 Bionic SoC, which is touted to be one of the first with a 7nm processor. The new 6-core A12 Bionic chip has 2 performance cores up to 15 percent faster and 40 percent lower power, and 4 efficiency cores with up to 50 percent lower power. Apple Senior Vice President Worldwide Marketing, Phil Schiller, said that this gives the iPhone XS and iPhone XS Max 30 minutes and 1 hour 30 minutes more battery life, respectively, compared to the iPhone X. Contrary to rumours a few weeks ago, Apple has stuck to the Type-A to Lightning 5W charger for the power adaptor instead of going for USB Type-C to Lightning 18W charger. However, the 3.5mm-to-Lightning dongle will not be included in the box this time around. Inbuilt storage options include 64GB, 256GB, and 512GB for both the iPhone XS and iPhone XS Max. Both of these phones sport surgical-grade stainless steel body with glass casing on both sides, much like the iPhone X. These are Apple’s first iPhone models with IP68 water and dust resistance – last generation was IP67 rated. The two smartphones also feature glass back panel and support wireless charging. Apple has done away with Touch ID in the 2018 iPhone range, and all of the three variants now come with improved Face ID, which allows users to unlock their handsets by just looking at it. Face ID uses infrared and dot projector technology, coupled with proprietary hardware and algorithm to make it one of the most secure mechanisms in the market. It is the “most secure facial authentication ever in a smartphone” as per Apple’s claims. The iPhone XS and iPhone XS Max feature an upgraded pair of cameras at the back. The phones have a 12-megapixel wide-angle sensor (f/1.8 aperture) and another 12-megapixel telephoto secondary sensor (f/2.4). The rear camera gets a 6-element lens and 2x optical zoom. There is also an improved TrueTone quad-LED flash at the back. On the front, the iPhone XS and iPhone XS Max get a 7-megapixel RGB camera sensor that’s said to be faster, and features an f/2.2 aperture.